Memes for Mean Gaming Gears - The Razer Star Wars: The Old Republic Meme Making Contest! Thank so much Philippines Hardware Zone.com!! May the force be with you! Thank you so much HWZ.ph!!!! May the force be with you! We'll begin distributing these goodies to their new owners this week. 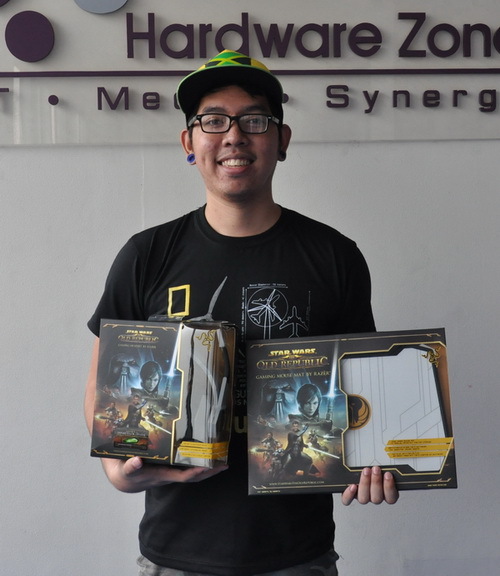 Here's Jun Louie Amador claiming the Razer Star Wars: The Old Republic gaming headset and mousemat for his brother Gabriel Amador a.k.a. yomi41. Congratulations! Lastly, here's Rayhan Rahman a.k.a. rayhandsome claiming his Razer Star Wars: The Old Republic mousemat. Congratulations!